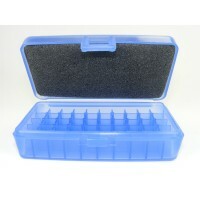 These empty FS Reloading brand ammo boxes can store up to 50 rounds of .32 ACP, .380 ACP, 9mm Luger and similar sized pistol cartridges. Stores 50 rounds of .32 ACP, .380 ACP, 9mm Luger and similar sized pistol cartridges. Maximum overall cartridge length is 1.22"
The FS Reloading Small Pistol Ammo Box will store 50 cartridges having a maximum case diameter not over .375" and an overall loaded length not exceeding 1.22".